Asphalt or bitumen is a gummy, black viscous semi-solid material used primarily in road pavement construction, waterproofing or as a mastic or glue. According to the bitumen industry, 85% of all bitumen used world-wide is mixed with aggregate filler and used in asphalt pavements and 10% is used for roofing or waterproofing . In 2007 it was estimated that about 1.6 trillion metric tonnes of asphalt was produced worldwide and demand continues to grow . Around 90% of the world’s roads are asphalt paved and the network is increasing year on year. The National Asphalt Pavement Association (NAPA) estimates investment in road infrastructure across the US and Europe is in the order of $190 billion per year in the public sector alone . Asphalt density (weight of material per volume) is one of the most important parameters used in calculations to determine the quality and quantity of asphalt needed to pave roads. To calculate the weight of material needed for a project awareness of the compacted density of the material is essential . The quality and uniformity of the asphalt mixture determines whether a road will be paved evenly to achieve the highest quality, most resilient surface. The standard test method (ASTM D70-09) for measuring and comparing the density of semi-solid bituminous materials or asphalt, as prescribed by ASTM international, is a pycnometer method . A pycnometer is a glass device made up of two chambers and is used for determining the density or more accurately the volume of irregular shaped solids or semi-solids. The sample is placed in the calibrated pycnometer and this is then weighed and the remaining volume filled with water. The filled pycnometer is heated or cooled to the test temperature and then accurately weighed. The density of the sample is calculated from the pycnometer mass and the mass of the water displaced by the sample in the filled pycnometer. The ASTM International Standard Test Method for Density of Semi-Solid Bituminous Materials (Pycnometer Method) - (ASTM D70-09) is not without its complications. One of the biggest problems is that the process is quite protracted, requiring more time than modern analytical methods. In addition, the pycnometer process requires repeated heating and cooling using a water bath as well as multiple measurements with an analytical balance. Without specialised analytical training and careful attention this method can be prone to analyst error. Also if the glass breaks during the measuring process, the whole test must be repeated from the beginning with a new clean glass pycnometer. Finally the glass pycnometer method requires a much larger sample than more modern methods. We ran density by pycnometer using the Hubbard-Carmick vials for years on our coker feed samples. It first involved weighing a clean pyc., then carefully filling it with water to the very top. You then replace the cap, forcing water through the hole in the cap to ensure there’s no air present. If there are bubbles, you have to refill the vial. You then weigh the vial with water, then dry it out. The sample, often being too solid to pour, is heated. Once it’s pourable (and generally extremely hot), it’s very carefully poured into the vial to the half point. If you pour too much, it affects the accuracy of the test and the vial must be cleaned and the whole process restarted. The sample is allowed to cool, then the weight of the sample is taken. Water is then added to the vial to the top, as before, and a final weight taken. The final value is a calculation of these four weights, which is then referenced to API tables for a result. The vial could then be cleaned (a tedious task unto itself) and reused later. The entire process was extremely time-intensive and in a busy production lab it was an unwelcome task. With the AccuPyc, we’ve been able to cut what was a 30 minute to an hour task into a few minutes of prep work: heat the sample, weigh the cup, pour the sample into the cup, allow to cool, then run. The results from the instrument have been consistent with those from the pyc and are likely more accurate, as it takes away a lot of the human error inherent with using a pycnometer. We’ve had the instrument several years now, and I still have technicians thanking me for purchasing it! 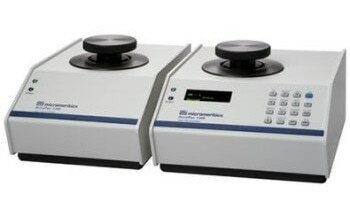 A modern analytical technique utilizes an automated pycnometer such as the AccuPyc II 1340 TEC, a fully automatic gas displacement pycnometer. This system can provide volume and density measurements that meet the ASTM D70-09 method  . The AccuPyc II 1340 TEC series provides high-speed and precision volume measurements while also removing potential for operator induced error. By utilizing inexpensive disposable sample cups, it is a much cleaner, faster and easier method. Finally, the sample volumes required for testing are substantially smaller than the classical technique. The AccuPyc II 1340 TEC includes an integrated Peltier thermoelectric controller (TEC) which provides temperature stability and accurate temperature control, ideal for obtaining true or apparent volume and density of viscous materials such as asphalt at controlled temperatures. The PC based control software of the AccuPyc II 1340 TEC provides an ideal way to calculate and record asphalt density and volume while allowing data to be closely correlated to results obtained with ASTM Test Method D70-09 if required. The AccuPyc II 1340 TEC is clearly an ideal solution to providing rapid and accurate density calculations for semi-solid bituminous materials. With disposable 3.3 cm3 sample cups to limit contamination and minimize cleaning of the sample chamber between analyses, and an integrated temperature control and data handling system, the instrument provides a clear advantage. A recent comparison of the ASTM D70-09 method and the AccuPyc II TEC to determine the density of four different asphalt samples showed only a 0.003% to 0.026% difference between the two sets of results . This shows that the AccuPyc II TEC can provide a much easier and rapid analytical method for the asphalt industry. Asphalt Institute and Eurobitume. 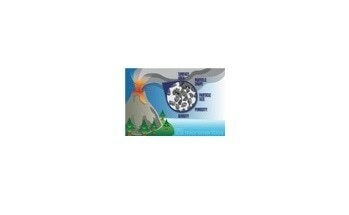 The Bitumen Industry – A Global Perspective: Production, Chemistry, Use, Specification and Occupational Exposure. Lexington, Kentucky, USA. The Asphalt Paving Industry: A Global Perspective, Production, Use, Properties, and Occupational Exposure Reduction Technologies and Trends, European Asphalt Pavement Association (EAPA) and the National Asphalt Pavement Association (NAPA), February 2011, Second Edition Global Series 101. Mangum, M.  Asphalt Paving Sector Presentation. Health Effects of Occupational Exposure to Emissions from Asphalt/ Bitumen Symposium. Dresden, Germany. Why choose asphalt? http://www.asphaltroads.org/why-asphalt/why-choose-asphalt/Retrieved February 18 2016. 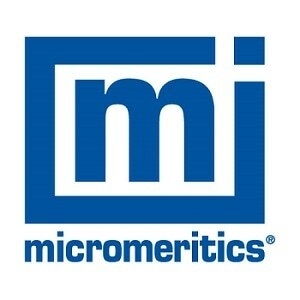 Application Note 164, Asphalt Density Using AccuPyc II TEC, Micromeritics.